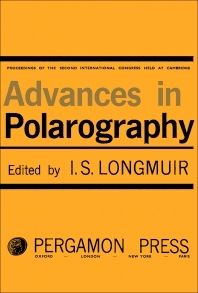 Advances in Polarography, Volume 1 is a collection of papers presented at the Second International Congress of Polarography held at Cambridge in 1959 in honor of the 70th birthday of Professor Heyrovsky. This book is composed of 26 chapters and begins with discussions of the principles, mode of operation, and application of several polarographic techniques, including oscillographic, derivative, continuous, and differential cathode-ray polarography. The succeeding section discusses the theoretical, kinetic, and fundamental aspects of these techniques. The remaining sections are devoted to the analytical, industrial, biological, and medical applications of polarography.